Note: I played through the original release of Doom 3 with one slight tweak: I used a mod that combines Wulfen’s hi-res texture pack and Sikkmod 1.2. It makes the game look a whole lot prettier and offers a lot of optional gameplay tweaks. The only gameplay change I went with was increased run speed because the default run speed is just the worst. It’s been said that familiarity breeds contempt. While I can’t vouch for the original context of the saying I can tell you from personal experience that this statement can apply to video games. For me, it applies to Doom 3. After spending at least sixteen hours on a playthrough, many hours of deep and thoughtful analysis, and vainly writing and rewriting thousands of words in an attempt to convey my thoughts on the experience; I’ve had an epiphany. Doom 3 just isn’t a fun game. It’s a sad realization to make since various aspects of the game had so much potential. In the end, none of them really mattered because they just didn’t contribute to an enjoyable experience. Progressing through the game became a chore; a joyless trudge through an unrealized vision. “Playing” felt a lot more like “tolerating”. The breaking point came in a level called Recycling Sector 2, which is less than halfway through the game. There all of Doom 3’s flaws coalesced into a mess of frustration which had me checking my progress to see how much longer I had to suffer through it; but more on that later. Ultimately, Doom 3 falls flat because it tries to be multiple things but doesn’t really nail any of them. It makes a valiant effort to combine story-driven narrative, a tense atmosphere, and frenzied shooting action; but just can’t quite deliver any of those things. A company-branded PDA that exists solely for exposition? Yup, that’s Doom! 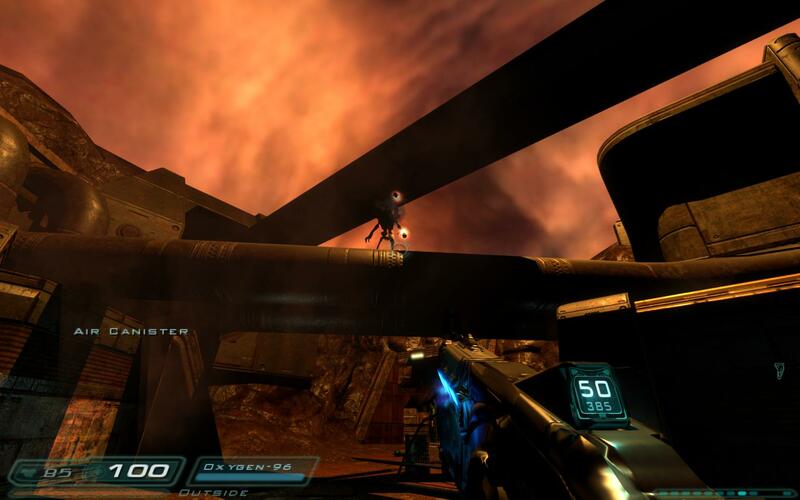 Doom 3 is the first game in the series to make the story a primary focus. As such, the game begins with a combat-free playable introduction to set the events of the game and introduce the player to the world. You arrive on Mars via shuttle and are free to explore portions of the game’s opening environment: Mars City. While your character is nameless and silent, he is still able to interact with other characters and objects in the game world. Walking up to another inhabitant of Mars City will prompt them to deliver a line of dialog, usually one that has to do about how spooked everyone is by the “secret experiments” going on. Select computers and other equipment will allow you use their interfaces to open doors, turn on lights, or perform other ultimately trivial actions. The primary vehicle for delivering the story is through the use of the PDA. In-game PDAs are what we might call tablets or iPads today; they function exactly the same way. Used to store emails, audio logs, and other personal information, you can pick up and access the information contained in any device you happen to come across. It’s an effective way to build the atmosphere of the game, even if there are some clunky aspects to its implementation. Audio logs can’t be paused, nor do they have a seek function. Since there’s no text transcript you’ll almost always have to remain at a standstill or stare at the PDA until the log finishes playing to be sure gameplay sounds don’t overlap the audio recording and cause you to miss something by accident. 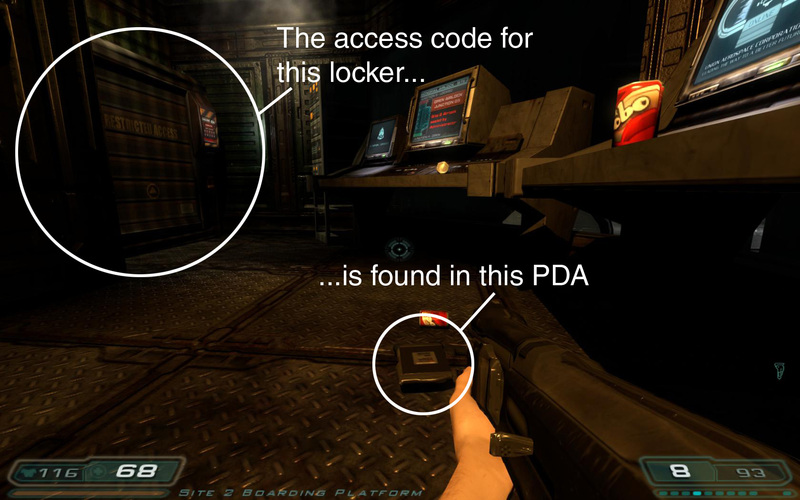 Quite frequently audio logs will contain access codes for storage lockers which contain ammo or other items, which is handy, but it highlights another limitation of the PDA. Since all of the information is all stored according to the names of the characters who owned the device, there’s no way to filter or search for specific content within these logs. For example: If you encounter a given storage locker, the only way for you to know if you have the access code for it is if you remember that specific locker being mentioned in one of the PDAs you previously picked up. The game seems to realize this kind of information would be cumbersome to keep track of, and the end result is that most PDAs will be discovered ridiculously short distances away from whatever thing the PDA would provide access to. Even with their shortcomings I actually love how using the PDAs builds the world within the game. It makes you stop and imagine what the “normal” game world might have been like before things went terribly wrong. Contributing to the sense of world-building, the visuals do more than their part to immerse you in Doom 3’s version of Mars. While the original release of the game looks pretty good overall, there are some downright muddy or chunky-looking spots. The more you focus on those spots the worse they look, with many detailed surfaces looking downright terrible when you get close enough to them. If you play the game now, you need the texture mod I linked to at the top of the post. 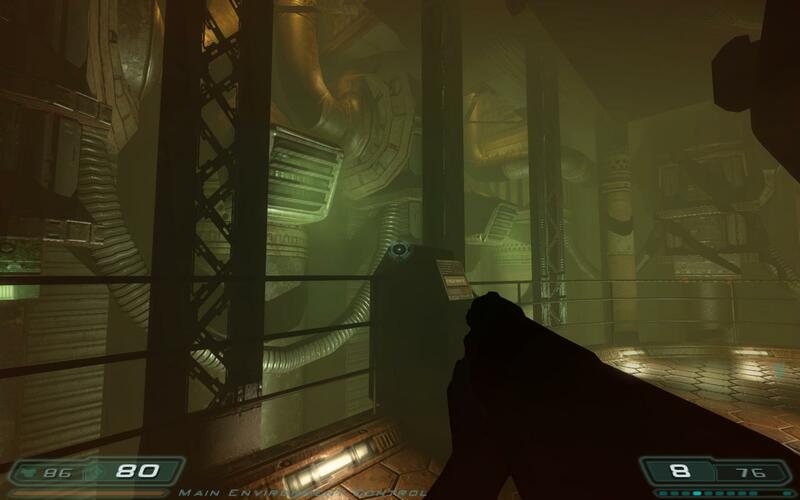 Thankfully, Doom 3’s lighting effects are truly timeless and serve as the major source of the game’s atmosphere. Now when I say “lighting effects” what I really mean is “shadow effects”. Make no mistake: Doom 3 is dark. There’s a reason UAC space marines are given flashlights as a standard issue: their bases apparently have a low lighting budget. 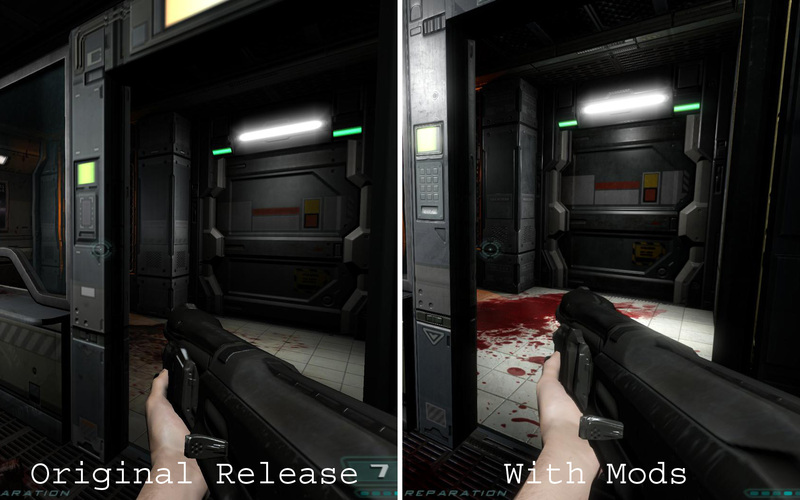 Notice the updated textures are less “chunky”, and that there’s more depth to the surfaces. Quite frequently the only option available to help you find your way is to holster your weapon, pull out the trusty flashlight, and navigate through the darkness. Yes, you read that correctly: You can’t use your gun and the flashlight at the same time. This intentional design decision has been almost universally panned by reviewers and gamers ever since the game’s release. The year is 2145, surely the capability exists to outfit soldiers with some kind of hands-free lighting device? Sure it’s possible, but it just wouldn’t fit the game. The developers must have felt, and I agree, that giving the player both a flashlight and a gun at the same time was too empowering. Darkness is used as a method to control the player; something to maximize the feeling of helplessness and thus emphasizing the tension. And tension, really, is the focus of this game. Doom 3 does everything it can to create a horrifying experience for its players, even though its legendary predecessors consisted of nothing but over the top action. All of the members of the demon horde you remember from the first two games are present here, though now they are presented with the objective of instilling fear in the player. 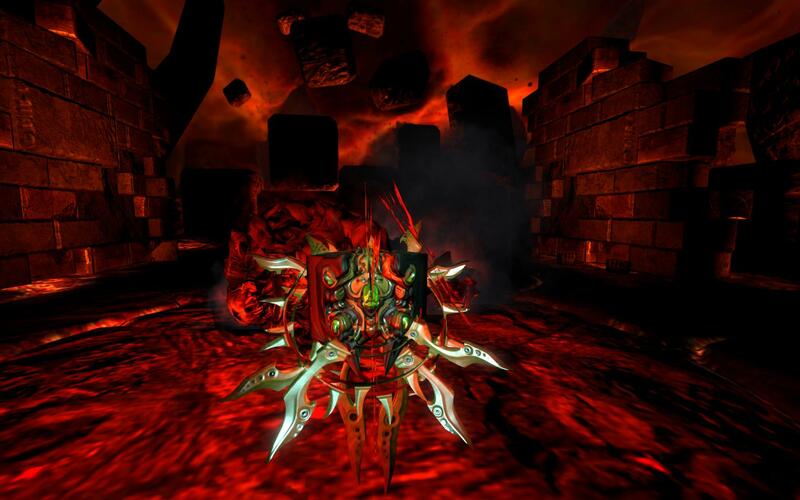 Most new enemies are introduced via a dramatic scripted cinematic, which attempts to highlight the specific, unique threats each enemy introduces rather than lumping them all into the category of “mindless cannon fodder.” You’ll rarely engage more than three or four enemies simultaneously, and one could interpret this as an intentional decision designed to reinforce each demon’s perceived threat. It may sound like sacrilege to diehard Doom fans who are used to running full-tilt and firing thousands of bullets at legions of enemies in a single level, but the new approach of Doom 3 actually works. For a while. The first few hours of the game are unforgettable. You’ll genuinely feel tense as you explore Mars base, searching for whichever route will let you progress forward. For a while demons seemingly pop up out of nowhere, sending your heart racing. And then after a few hours of gameplay the realization hits: the demons do literally pop up out of nowhere! The term “monster closet” was coined to describe a room or space in a game’s environment that serves no other purpose than to hide an enemy and put the player at a disadvantage when it is revealed. Monster closets are Doom 3’s mantra. Demons behind doors, demons behind walls, demons under the floor, demons in the ceiling, demons in the shadows, and sometimes for good measure demons will just appear from a spontaneously generated and conspicuous haze of orange plasma. It’s an element that works well in the opening stages of the game to generate heart-stopping scares before the player learns to expect them. There are some genuinely frightening moments there, but the more frequently they occur the more you notice just how scripted these once-scary moments are. These aren’t organic encounters; the result of a player being put in a “genuinely” scary environment with monsters that have their own agenda. No, this is a virtual haunted house where every scare and every surprise is carefully designed in an attempt to elicit a response of fear from the player. Eventually you’ll learn to recognize the warning signs of these scripted scares, at which point you’ll loathe the moment and fear will be replaced by annoyance. Monster closets and surprise encounters worked in the early 90s with the original Doom because the game was abstract enough that none of these tricks felt out of place. Sure there were alcoves and hidden enemies galore, but they were fitting considering you were essentially running through a virtual haunted house – with guns. Doom took a certain pride in its cheap scares and traps because they never proclaimed to be anything other than that. In Doom 3, where the player is supposed to be traversing a cohesive and coherent world, every scripted encounter feels like a cheap shot. This scripting ultimately chips away at the established atmosphere and takes you out of the game’s world. Mars Base turns into one boring corridor after another where your only thing tested is your ability to guess which door the monster is hiding behind and how fast you can get your finger on the trigger. Due to the understandably claustrophobic level design, your only option in a firefight is to backpedal slightly and hope you’re spraying enough ammo forward that the enemies die before you do. There are no tactical options available here. There’s no room to run and gun, especially since the game will repeatedly lock you in the same enclosed area as the newly spawned enemies. With no room to maneuver, even two measly imps can kill you in about 20 seconds flat. If it doesn’t sound fun, that’s because it isn’t. Games are supposed to be fun, and I couldn’t deny that Doom 3 was starting to become quite wearisome about a third of the way through. Wearisome, but not intolerable. I kept telling myself that any moment now, some new mechanic or monster or element would be introduced to add some enjoyment back into the game. When I got to what I thought was going to be the monorail sky bridge, the corridor collapsed in front of me and dumped me on the martian surface. What’s this? Is the game really going to let me freely walk around a wide-open space? And blast enemies that are more than ten feet away? Is this the change I was hoping for? Hoping against hope, I began to believe the game was going to open up a bit and offer some more spacious encounters. My oxygen supply is finite and rapidly running out, but at least there’s a certain freedom of movement here. All too soon I had vanquished the few enemies present in the outdoor arena and was left furiously hunting for air canisters so I don’t suffocate. After a few more moments I make my way to an airlock and return to the claustrophobic corridors I’d begun to loathe. But surely this first experience in a larger area was a sign of things to come! Oh look, poisonous gas. Too bad I don’t have a self-contained air supply. Wait a minute, I do! Why is this a problem? The meaning lurking underneath the surface of these quotes brings two surprisingly relevant questions to my mind. The first one is: Who are these friends of mine that Betruger has supposedly already claimed? The character you play has no name and no backstory. He’s a new transfer to Mars Base and knows nobody on the entire planet. Why on earth would they include a line like this in the game? Am I supposed to have felt some kind of connection with one of the other characters introduced by the game? Or is this a subliminal attempt to get the player thinking about his own friends in real life, and project the fear of loss onto them? Unless the developers were extremely certain their psychological experiment would work, I really can’t understand how these lines made it into the game. From what I can figure, the best case scenario is that this was the result of some horribly sloppy writing that nobody fully thought through. 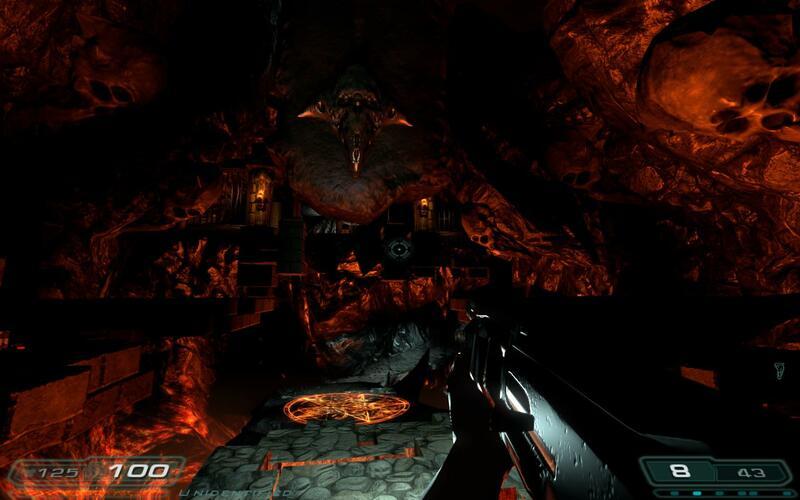 The other question is: what exactly is hell in the world of Doom 3? Obviously it would have to exist as some sort of literal, physical place, but what is it? What are the demons doing in hell? Who is in charge? Why does the leader of hell need to give Betruger any authority or control of invading Mars? Why do the residents of hell need a human-made teleporter to get to Mars? If the demons can flood Mars via some sort of portal, why do they need to take spaceships to get to earth? (Using spaceships to get to earth was supposed to be a major plot point prior to the Recycling Center). Why can’t they just use the teleporters to get there? Considering the human world of Mars is rather meticulously mapped and planned out, it’s rather jarring that hell exists just for the sake of existing. Some of these questions may be answered in the PDAs scattered about the later levels, but considering how much impact the answers to these questions would have on creating a cohesive story I’m surprised they wouldn’t be more overt. At least hell has interesting art direction. Apparently in the ancient martian language, “cube” meant “horribly spiky murdery thing”. Coming into the game too late to make much of a difference, is a genuinely interesting story thread about archeological ruins found on Mars. As it turns out, there was an advanced alien civilization that used to reside on Mars. This civilization used a combination of their sciences and religions to use portals for traveling to the different planets in our solar system. At some point in their history this alien species also accidentally opened a portal to hell. Various PDAs and computer terminals will provide details unearthed about this society and how they struggled against the demons. Eventually, this race sacrificed itself to create a weapon capable of killing the demons and closing the portal to hell. Say hello to the Soul Cube. 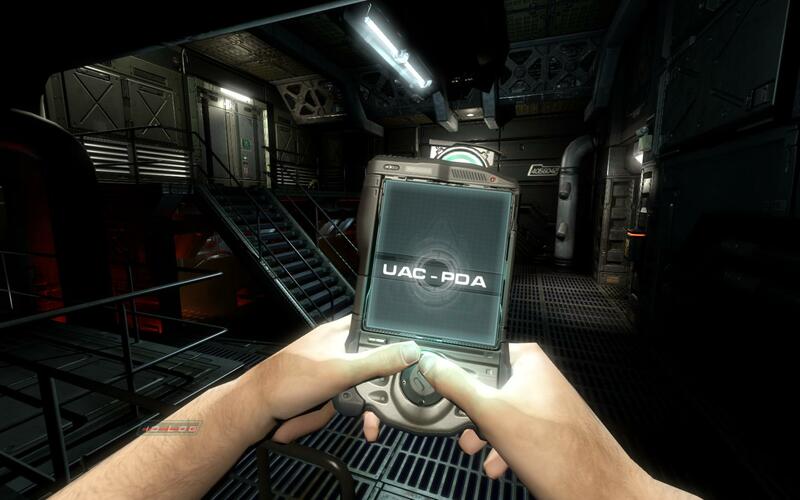 The alien weapon may actually be the most interesting gameplay mechanic in all of Doom 3. In order to use it, you must first “charge” it by killing five other demons. Once it’s charged you can use it to instantly kill any other enemy and transfer its health directly to you. It brings a sorely needed element of strategy to the close-quarters firefights. No longer are you just pressing the fire key, you’re actively picking out the weakest targets first so you can use a charged Soul Cube to take out the more powerful foes. It’s a shame neither the alien backstory nor the Soul Cube is introduced until the last quarter of the game. There’s a lot I could still say about the gameplay of Doom 3, but I feel like it would just be a waste of words. The story had potential, but it unfolds too slowly for you to really care about it. The atmosphere is, up to a point, incredible. There are plenty of fun and entertaining elements present, but you’ll experience almost all of them before the game is a quarter finished. If Doom 3 got anything right, you would expect it to be the shooty bits, but that’s not the case. There’s a reason I didn’t talk about the game’s weapons; nearly all of them are pathetic, and none of them are fun to use. The gameplay might be passable in small doses, but the thematic and story miscues really put the nail in the coffin for me. If it’s horror and action your looking for, there are other games to spend your time and money on. Doom 3 does have an expansion called Resurrection of Evil which contains new content and supposedly remedies a lot of the issues I have with the original game, but it will be quite some time before I’m ready to step into the world of Doom 3 again. Until then, I’m going to spend some time on games that are actually enjoyable. May 16, 2016 in Retrospective. Tags: 2004, death, DoomGuy, First-person, FPS, Frustrating, horror, id Software, is it over yet?, monster closet, sci-fi, shooter, violent, why did I buy this? ← Dark Souls Journal #01 – What Have I Done? I bought the game back in 2004 and, for most of the reasons you describe, never bothered to finish it – playing it for the first time in years I’m reminded of the square environments, the dull PDAs, the small-scale scripted fights, the weak guns etc. Endless identical maps called Alpha Processing Sector 2 and Delta Engineering Subsector 3 etc. It reminded me of Alien Trilogy, a bog-standard PS1 FPS, but with coloured lights and bump-mapping. Ah, but the theme music was great (the ambient sound too).